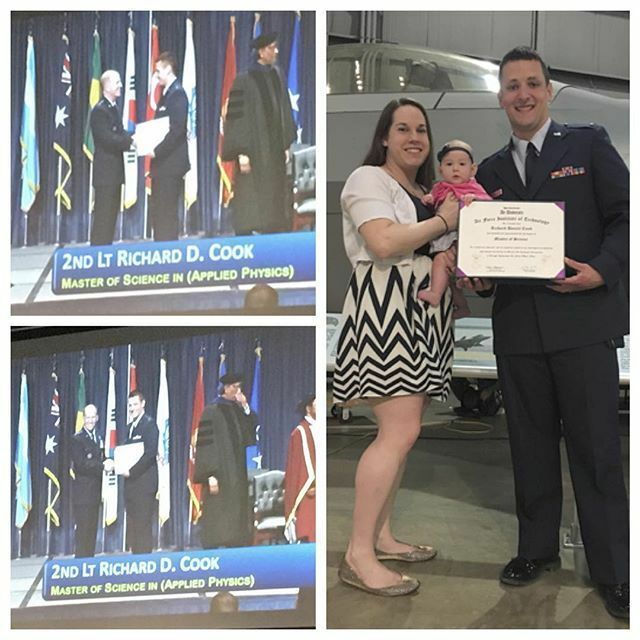 Last month, just the night before we left Ohio, Lieutenant Lovemuffin graduated from AFIT (the Air Force Institute of Technology) with a Master of Science degree in Applied Physics. He worked SO hard for that degree. It was really special being able to watch him defend his thesis in February, but seeing him walk across the stage in what is one of the coolest venues ever (the National Museum of the US Air Force) was incredible. Many people opted not to take their babies/kids, but I decided that no matter how difficult it was, it was important for Annabelle to be there. We found out about her and had her all during Dan's time at AFIT, so it only seemed fitting. She was on her best behavior... she ate twice, fell asleep once, and flirted with LOTS of people during the ceremony. I even received a compliment on her behavior afterward from someone sitting behind us. I'm so glad she was able to be there with us, and I know Dan was glad to have her support too. Now, we're all settled into our home in Texas, and we're enjoying some leisurely days before Dan begins pilot training! Have you been to the National Air Force Museum?